Dubai: Electric scooters are becoming a popular mode of transport for residents living and working in several new communities in Dubai. Usually used for distances considered too far to walk and too short to drive, the electric scooters require that the riders stand on them while holding on to a handlebar and pull a lever to activate the electric motor. Residents say they are convenient and help save time and money. 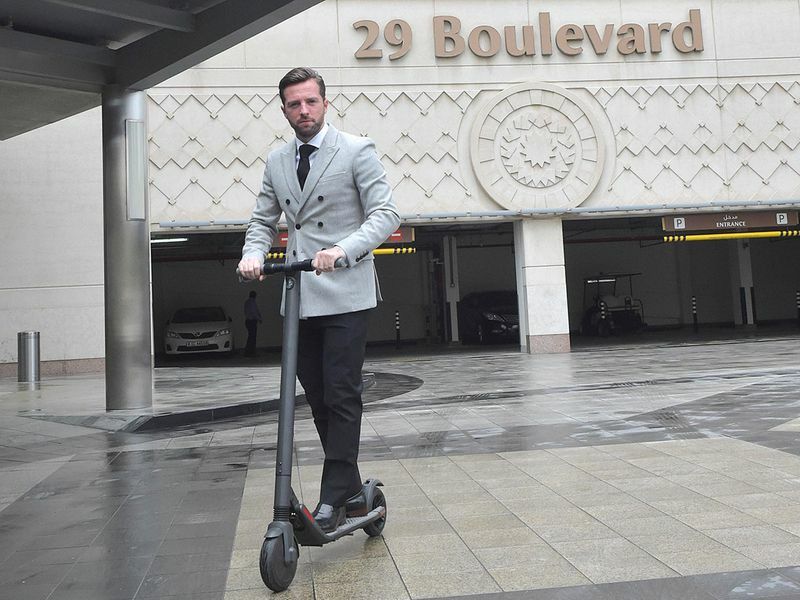 A few blocks away, Neil Ormond, a British resident, said he actually sold his car and uses the scooter and the Metro to reach his office in Jumeirah Lake Towers. Available under various brands, the average cost of the scooter is Dh1,600. A huge craze in big cities like San Francisco, New York and London, motorised e-scooters are being touted as the future of urban transport as they are considered not just hassle-free and cost-efficient but also fun and environmentally friendly. The speed factor has sparked its share of controversy in the west, with some saying the scooters are a nuisance fraught with danger, especially in busy areas. For one, the scooters need some getting used to before riders can get comfortable with them. Novices trying them on sidewalks can pose a hazard for pedestrians and other riders. They can also be unsafe when riders use them in tandem. As things stand, residents ride e-scooters along pavements. But do they need to be registered with the Road Transport Authority (RTA)? 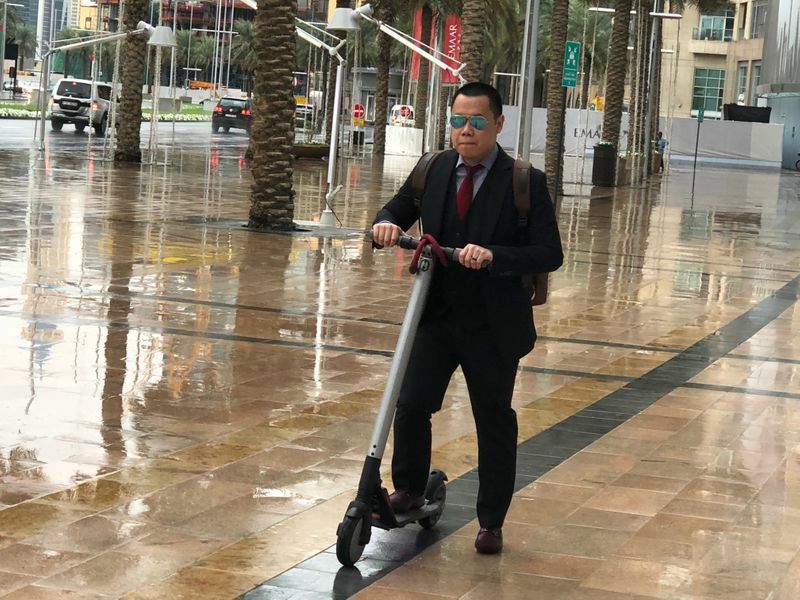 According to Jamal Al Assada, director of vehicle licensing at RTA’s Licensing Agency, the scooters technically do not qualify as vehicles or motorcycles under the law or the GCC Standardisation Organisation (GSO). “Therefore, they cannot be registered or driven on the roads,” he said. 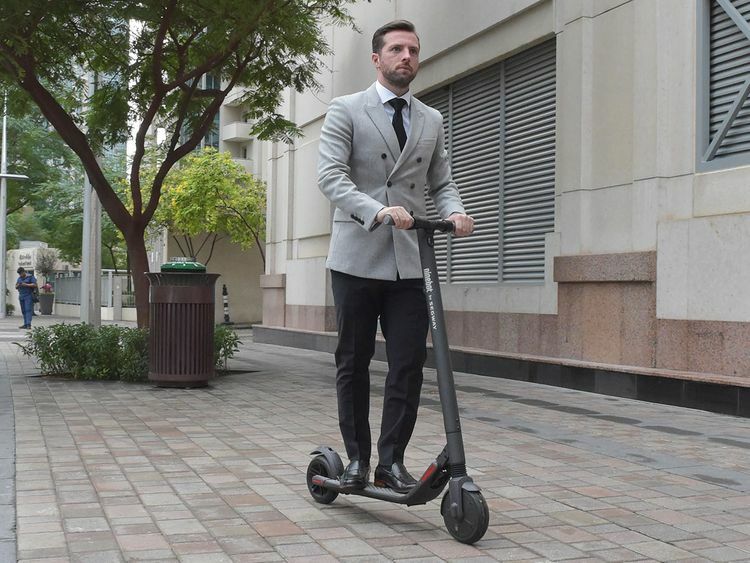 You can even hire e-scooters in Downtown, thanks to Quikly Mobility, a company that has launched what it claims to be the first dockless micro mobility platform in the UAE. Available at different points in the community, the scooters can be availed by downloading the Quikly app. Once you’ve registered, all you have to do is scan the ‘QR’ code to unlock the vehicle and start riding it. When you reach your destination, you have to tap the app to end the ride and park the scooter at a suitable place. Sean Fuller of Quikly Mobility said, “Every scooter has a SIM card and the service is able to track a rider’s movements with the help of GPS. A sum of Dh3 is charged every time a vehicle is unlocked, with 50 fils being added to every minute of use there on.” In other words, a five minute journey would cost the rider Dh5.50. “Our scooters are typically used for short distances, the last mile of a journey, so they are very handy,” he added. It is a plug-in electric vehicle with two or three wheels. The electricity is stored in a rechargeable battery which drives the electric motor. Distinct from a motorcycle, the scooter has a step-through frame with riders holding on to handlebar and pulling a lever to activate the motor. Dh1,600 on an average. It is available in different brands. Do you need a special licence to ride a scooter? No, not as of now at least.